July and August in Photos! Keeping up with the Summerwind Marchadors group. July and August were packed! A lot of pictures here – Gaia, Hawke, Diego, Beethoven, Bacara do Summerwind, Violeiro de Itajoana, Santa Fe, Brazil, our clinic!!! The Marchador Clinic and the Brazil trip also have their own post with more photos! Click on each photo to view larger. and then the back button to return to the album. New photo of Ximoio de Maripa! Hawke’s sire is maturing into a beautiful horse. All of the photos show 3 feet on the ground, the sign of a smooth gait. Beethoven do Summerwind (buckskin) carries the banner in a July parade in Canada. It was almost a parade of breeds with a paint, TWH and Friesian in the group. Thanks Laurie! Violeiro de Itajoana having fun with cows in Wyoming. Photo by owner. Brasilia do Summerwind – look at that movement – it’s great! It’s time to get back to work! Azenha de Maripa. He’s growing up! Hawke do Summerwind is 1 of 2 Azenha foals in 2013. 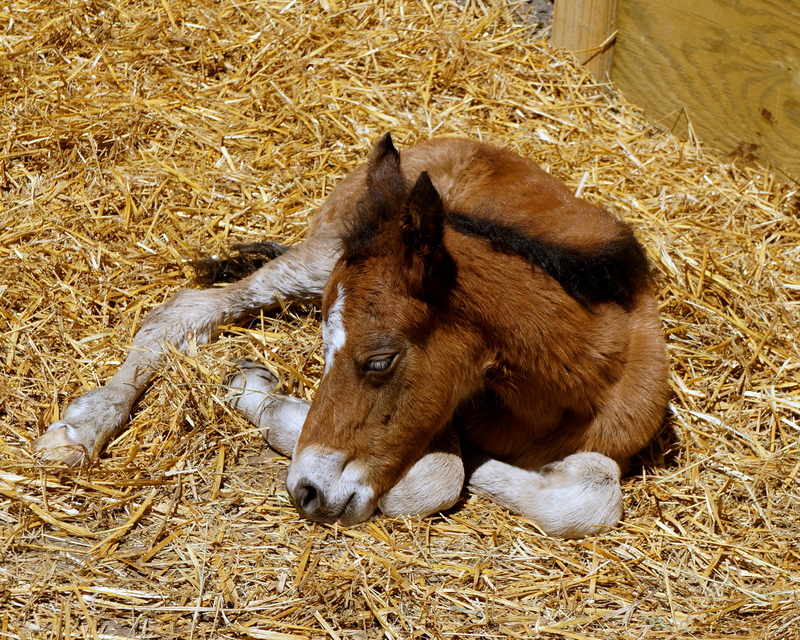 His half-brother is doing okay after the tragic death of his surrogate mother last month. 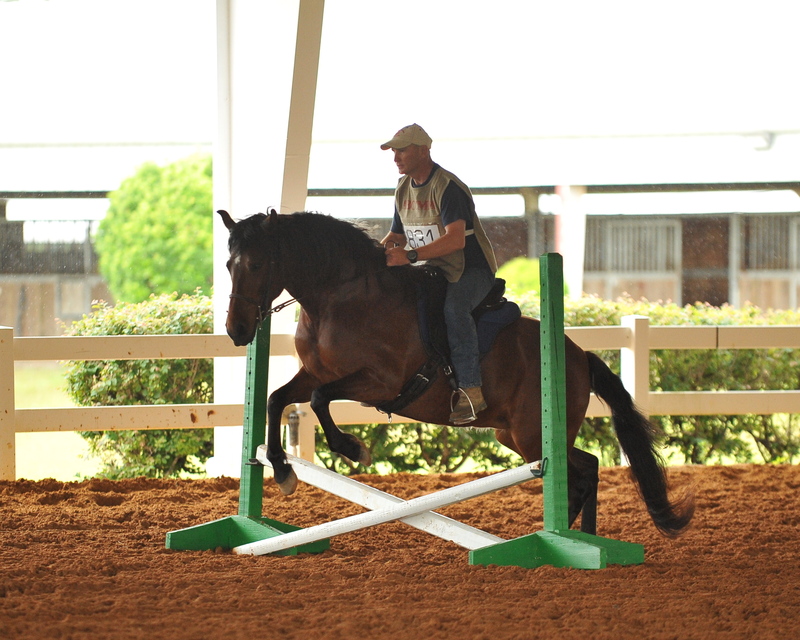 THE GAIT article appeared in Saddle and Stirrups ipad magazine in August. Check out the post for it to read the article in pictures. We got to Santa Fe with some of my sisters and had a fabulous time in a fabulous city. Diego do Summerwind is now in Vicki Claybaugh’s new barn in PA.
Brasilia did great at the MM clinic, especially considering she hadn’t been ridden very much during the past 2 years! Gaia takes over her own training! With Adrienne and Bill at the August MM Clinic. Jeff Bosley and family with Bacara do Summerwind and the 2012 Lucas Guerra Award for wining the functional test at the USMMA Ocala clinic. Hawke got out with the rest of the herd in August. He seems to be loving it! SW Update – SW Wins and Clinic Results! While the main reason for holding the clinic was our education, the format was fun and exciting. Evaluations by the judges was very informative and helpful. We did learn a LOT! Thank you Kate and Tiago! A blue ribbon for Connie and Leo! 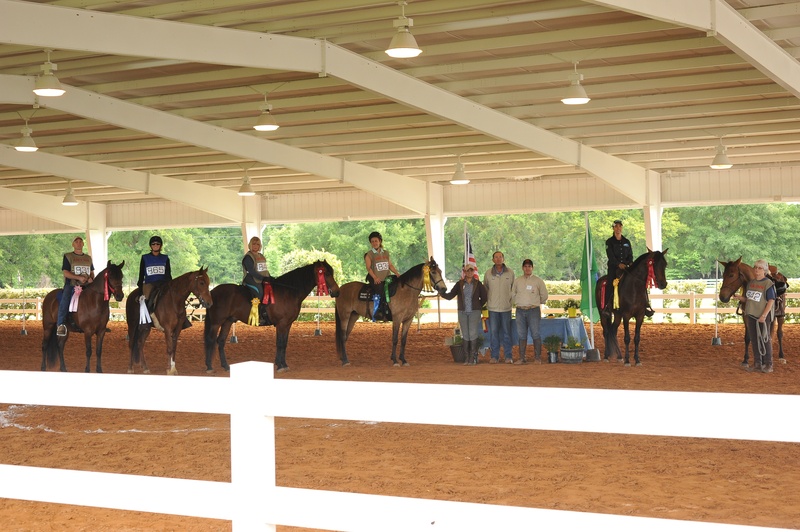 The Trail Ride – 1st place went to Aline Greene of Saint Horse Marchadors, SC on Erva-Doce de Tesouro. 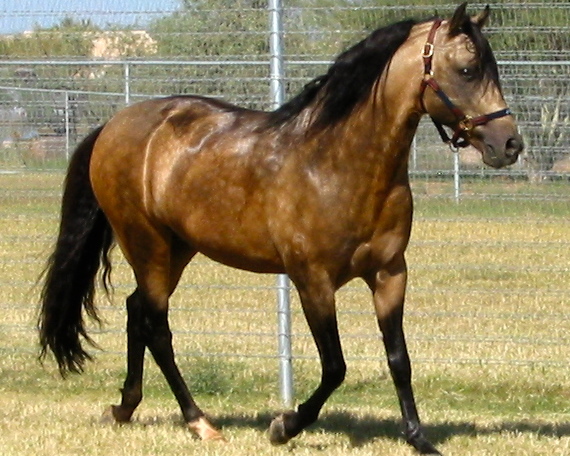 Conformation and Marcha – 1st place stallion to Bill and Sandy Kambic of Haras Lucero, TN with Ritmo A.J. 1st place mare to Bill and Sandy Kambic of Haras Lucero, TN with Aliane Fazenda Zouga. Aliane was bred in Brazil by Rick Schatz, then Fazenda Zouga, now in the U.S. breeding as Flying Oaks Ranch, OK who also was at the clinic. 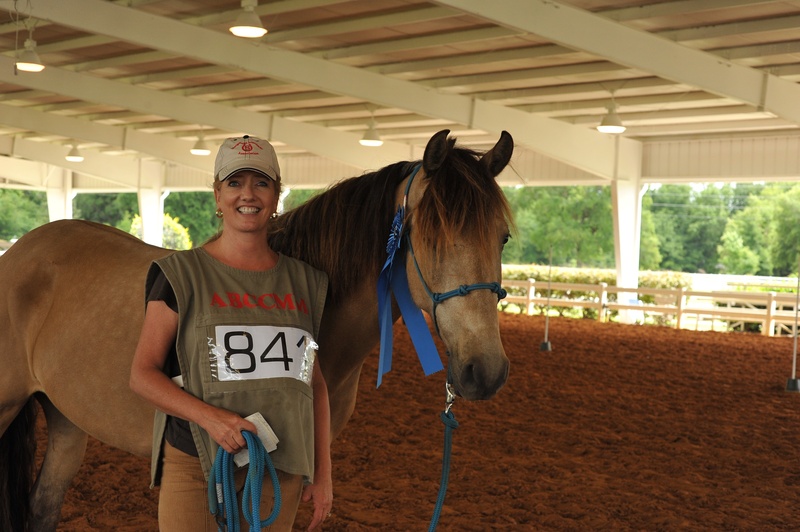 1st place gelding to Connie Claire, our clinic organizer, of Ocala, FL with Leo, aka DaVinci do Summerwind, bred by us. Jeff showing his winning form on Bacara! Whew - it was close! Functional Test – 1st place won by Jeff Bosley of SW Future Foal @ Lumber Bridge on his mare, Bacara do Summerwind, bred by us. For many participants, this was the first time they had ever done this! The riders and horses were learning fast, but there was only time for one run. Grand Champion – Combining all of the scores over all three days, this was awarded to Jeff Bosley of SW Future Foal @ Lumber Bridge with Bacara do Summerwind. Congratulations to everyone! It was a great accomplishment! The awards ceremonies were on Sunday, a great finale!